The term "design-build" hardly conjures images of architecture as art form -- especially for projects like office environments. 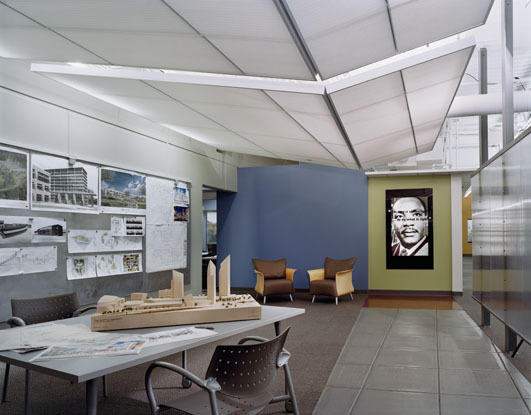 But for St. Louis-based real estate and design-build company Clayco's architectural arm, Forum Studio -- with its sweet spot in inventive and original workplaces -- the chance to craft their own interiors meant rare creative freedom. "The driver of this project was that, as a design-build company, we could do anything a client would need for a corporate headquarters," says Mike Benz. With Clayco's CEO and chairman Bob Clark long convinced of the value of thoughtful design, Forum Studio could apply blue-sky thinking to their new home. Forum Studio's offices were being moved from a separate facility and merged with work areas for engineers, real estate development specialists, and construction project managers. "Our work involves a lot of professional disciplines in a very collaborative process," Benz explains. Half of an attached warehouse space was adapted for the new office setting -- dubbed the "Studio" -- accessible through a new, grand entry. 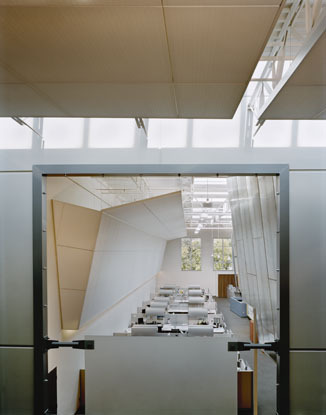 Benz envisaged a layout both functional and imaginative, highlighting spaces with unique images and associations: an innovative "Think Tank" conference area; an informal "Treehouse" socializing space; and an "Autobahn" pin-up corridor. The result spatially mirrors the group effort and constant information exchange. 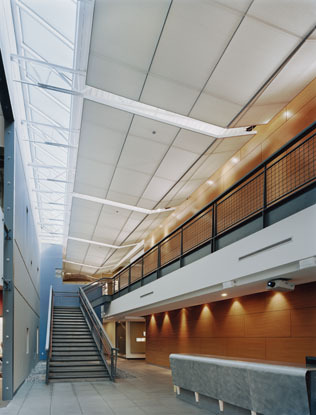 Adding radiance and formal intrigue are what Benz calls "clouds" -- evocative folded and illuminated structures made from Hunter Douglas Architectural's Techstyle® ceiling system. 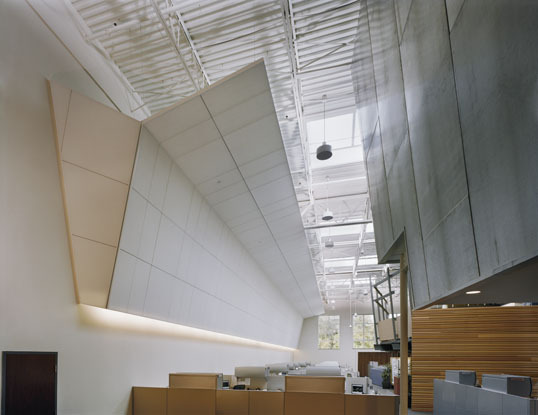 The sculptural application seems as innovative as the space programming. 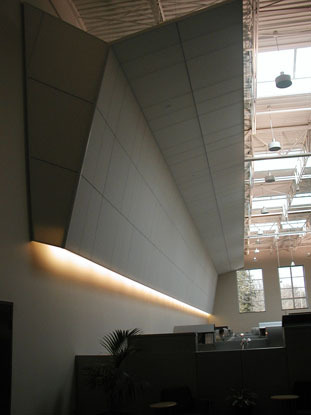 First, Benz devised angled surfaces and vertical expanses from a product that is usually only horizontally applied. 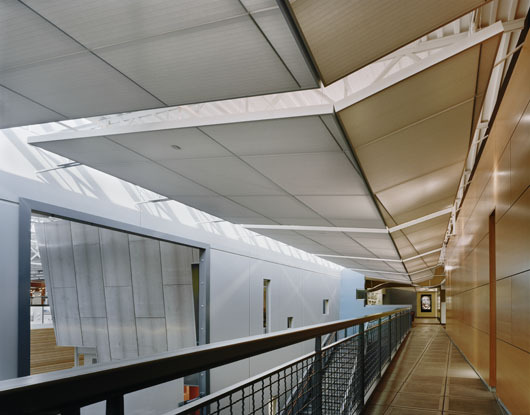 "I thought you could use it like origami," says Benz, noting that the ceiling system's lightweight, non-woven polyester face stretches tautly over a fiberglass structural frame. Second, exploiting the sheer material and ribbed fiberglass construction Benz backlit the panel assemblies with high-efficiency lighting fixtures. "We were the first to use it with light behind," Benz later learned. "The clouds provide a little ambient light, but the real purpose is to highlight the 25-foot-tall space." In this way, an interior finish system known for a monolithic, clean appearance and unobtrusive 1/4-inch reveals that tend to recede into the background became the articulation of dimensional, powerful form. 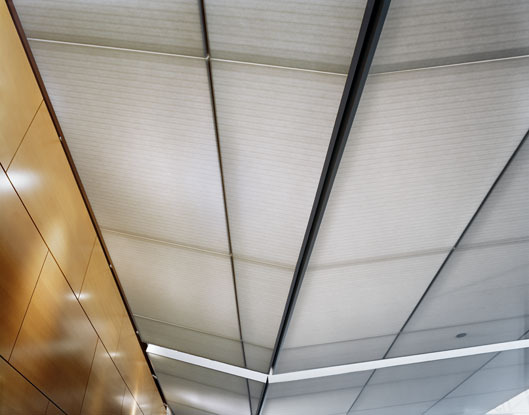 Kim Graaskamp, the sales/marketing director for Hunter Douglas Ceilings, notes that "One of the most striking things about the Clayco space is the attention to detail. 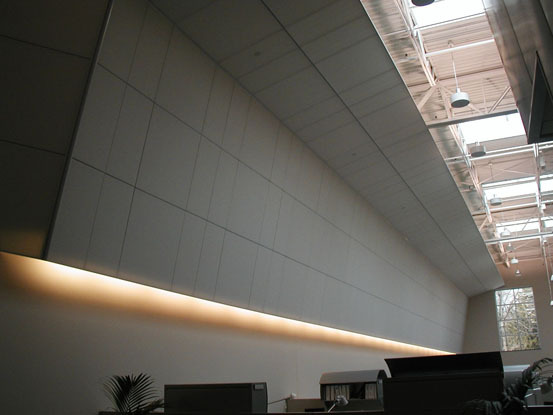 The theme of reveals is carried throughout: from ceilings, to walls, to floor tiles, to the metal cladding on the conference room. So precisely is this theme carried through that the reveals in the lobby clouds are actually mimicked in the poured concrete of the second-floor balcony." Benz found the sculptural aspect so alluring that he has used it again for a very different client. "We used it again on a nightclub in St. Louis, this time with colored gels behind the panels," he reports. Clayco HQ is no disco. But it is compelling and energizing as a work environment -- a reflection, perhaps, of youthful executives like Clark. Matching the excitement of the cloud forms are large skylights and a prominent floating staircase. 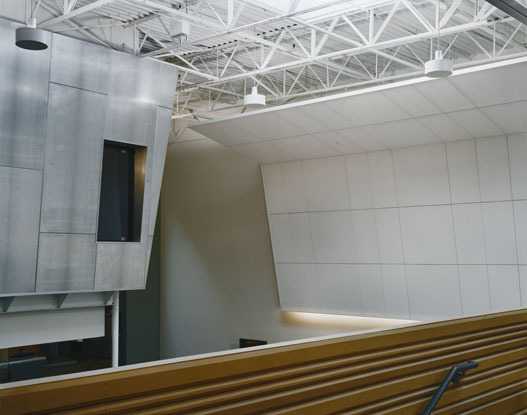 Exposed structure and ductwork strengthen the loft-like appeal -- and reinforce best construction practices among less experienced designer-builders. Also to that end, ever-present white boards, open meeting zones, and low-walled, four-person bullpen workstations encourage ample communication. Throughout the facility, cutting-edge computer and display technology is within reach. In the Think Tank, for example, four main TV screens serve as one large display or four independent ones. During meetings, Clayco managers can project construction documents, record mark-ups on the smart board, and even produce a webcast. For a break, employees can climb the Treehouse or slip out to the redesigned lunchroom, the landscaped courtyard, or one of several coffee bars. "Previously the building was sliced in two and very cloistered, with lots of corridors and closed private offices," says Benz. "But our culture was different. We're very creative. Now there's openness and a sculptural quality -- your eye wants to wander -- and the palette of materials reflects a more creative environment."